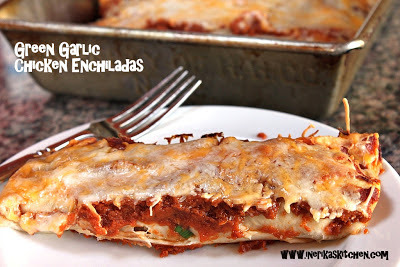 Of all Mexican food, I think I love enchiladas most of all. I make my enchiladas with flour tortillas, but if you prefer corn tortillas, by all means use them. Note: The canned chiles in adobo sauce give the sauce a smoky backstory, but they also add a little heat. No one in my family objected, but if your kids are really resistant to spicy food, use some mild chili powder instead of the canned chiles. Store-bought rotisserie chicken and an easy homemade enchilada sauce make these chicken enchiladas quick to put together. If green garlic isn't in season, use fresh garlic cloves and green onions instead. Make the enchilada sauce: Put the tomatoes with juice, chiles, onion, cilantro, and lime into a blender or food processor. Blend until smooth.Preheat the oven to 350 degrees.In a large bowl, combine the chicken, 2 cups cheese, 1 cup enchilada sauce, and chopped green garlic. Mix well to combine.Spray a 9x13 baking dish with nonstick cooking spray, then pour in about a cup of the enchilada sauce, spreading it to cover the bottom of the pan.Working on a flat surface or large cutting board, lay out one tortilla. Spoon about 1/3 cup of the chicken mixture in a line down the middle of the tortilla. Roll the tortilla over the filling, then place the filled tortilla seam side down at one end of the baking pan. Repeat with the remaining tortillas, cozying the enchiladas up against each other. When you've made all the enchiladas, pour another cup or two of the sauce on top and spread it around with the back of a spoon so that all the tortilla surfaces are coated with the sauce. Sprinkle with the remaining cheese.Cover the pan with aluminum foil and bake about 45 minutes. Uncover the enchiladas, then bake 5 minutes more. Serve hot. - In the filling, use about 1 cup queso fresco in small dice instead of the other cheeses? @Faye you could certainly put some vegetables in - chopped cooked (or frozen) spinach, or shredded zucchini with some of the moisture squeezed out, or mushrooms as you suggest. As to the cheese, I think it's completely up to you. I don't use queso fresco much but I'm sure it would be delicious.